Let’s consider the sweetest fruit in nature: fig. Do you know the best thing about figs? First of all you can catch one and eat it right below the tree; you peel with your hands without the need to wash it, and then, and above all, that fig itself tells us when it’s ready! When you can see that little nectar drop in its bottom part…a drop that looks like honey! Well, let’s now consider honey, a very sweet bees gift, that has remarkable nutritional properties. Honey soothes the cough and has a decongestant action on the respiratory tract, protects and detoxifies the liver, regulates the digestive system, for the blood it has an antianemic action, for the bones it fixes calcium and magnesium. We put figs and honey toghether with the magic of truffle to give you pure sweetness in a jar: our dried figs and truffle honey, that you can buy at our restaurants or online. It will arrive directly at your place, worldwide! It can be served with seasoned cheese and cold cuts (try it with parmigiano reggiano!). Or you can cut them on cream icecream and pine nuts, like in our official dessert. And why not, then you feel in a particular need of sweetness, just open the jar! 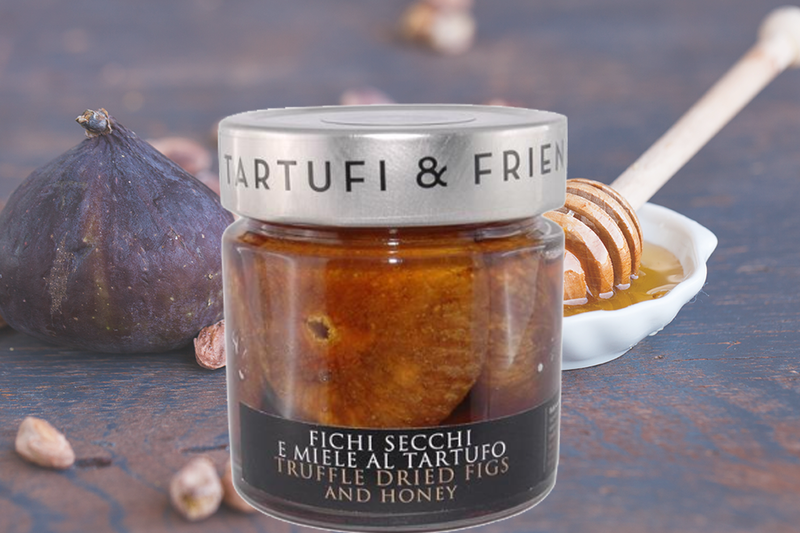 Buy now dried figs and truffle honey and discover all truffle products.